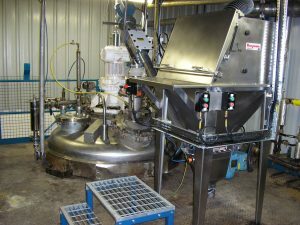 Witton Chemicals has many years of experience in drying many different types of powder. We currently have 3 dryers for main production and a vacuum oven for scale up work or low volume materials. All have an operating temperature of ambient to 90°C and vacuum down to 100mbar. The large 1,700L stainless steel Vrieco-Nauta cone dryer can dry batches up to 800kg of dry powder per batch. It is connected to a vacuum pump with the latest membrane technology to reduce emissions. This also allows the capture of solvents for possible reuse in the process so helping to reduce costs. The smaller 1,000L Vrieco-Nauta dryer has a capacity of up to 500kg of dry powder per batch. Witton also has a 1,000L stainless steel ribbon dryer which has a capacity of up to 500kg of dry powder per batch. Material can be packed as required from the dryers into FIBCs, kegs or bags. All dryers are fitted with dust extraction systems. Witton has experience in drying a few kilos up to campaigns up to several hundred tonnes per annum.